I bet the introverts in France right now are rejoicing. According to a NY Times article France Lets Workers Turn Off, Tune Out and Live Life “a provision in the labor law does not ban work-related emails, but does require that companies with more than 50 employees negotiate a new protocol to ensure that work does not spill into days off or after-work hours. Some consultants have recommended that employees and managers avoid the “reply all” function on emails to groups so that only one person is being asked to read an email and respond, rather than half the office. Another approach recommends setting a time each evening after which employees are not expected to reply — several firms have designated the 10 hours between 9 p.m. and 7 a.m., others the 12 hours between 7 p.m. and 7 a.m.” Companies are on their own in how they implement the new law and can be creative in their execution. One of the best ways to encourage employees to take more time off from working is to model that behavior. 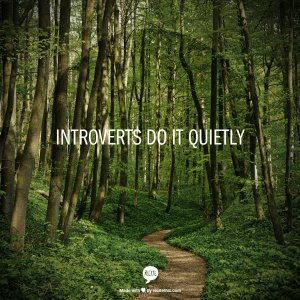 Introverted leaders who close their door, take walks and leave work on their desk send out the message that it is okay to have a life. Though many will argue that legislating a break from work is none of the government’s business, this move does point out that our work lives have really gone askew. Having support from our organizations and even government might help push some more balance back into our frenetic working lives. And with balance comes the quiet time to think, dream and reflect. All these quiet pursuits make us better employees. This entry was posted in Uncategorized on January 4, 2017 by Jennifer Kahnweiler.